Rodama: a blog of 18th century & Revolutionary French trivia: On the road - the "Turgotines"
This monster from the Alsace Museum of Post and Telecommunication in Riquewihr is a reconstructed "Turgotine", one of a new breed of fast stagecoaches that appeared on the King's highways in the last quarter of the century. As the name implies, they were the brainchild of Louis XVI's enlightened minister, Anne-Robert-Jacques Turgot. 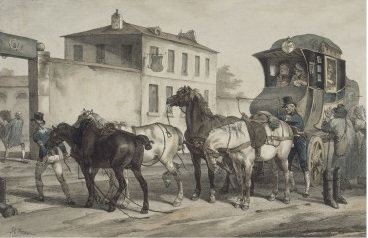 The Alsatian Turgotine hits the road, drawn by four "study Breton horses"
Until Turgot, control of public transport - like so much under the Ancien regime - had been the preserve of private monopoly. 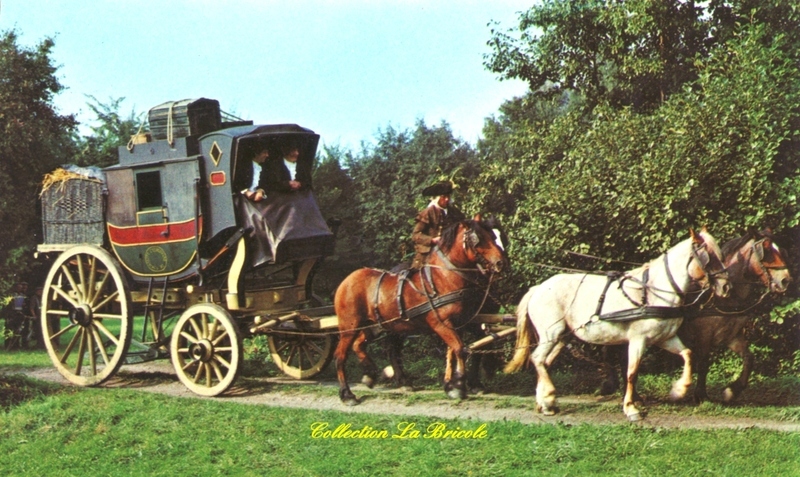 “Les messengeries” - the mail-coach service, which included a rights to all passenger carriage – was part of the general Postal “farm” with the major routes subleased to eight “fermiers particuliers” . As Turgot, champion of free enterprise rightly perceived, this placed a stranglehold on development and deprived the government of lucrative revenues. In August 1775 he unveiled an ambitious - and ultimately abortive - plan to buy out the farmers and consolidate all stagecoach, passenger and mail coach services into a single government bureau . A royal ordonnance published on 12 August 1775 set out not only these plans, but an entire blueprint for the new improved service. 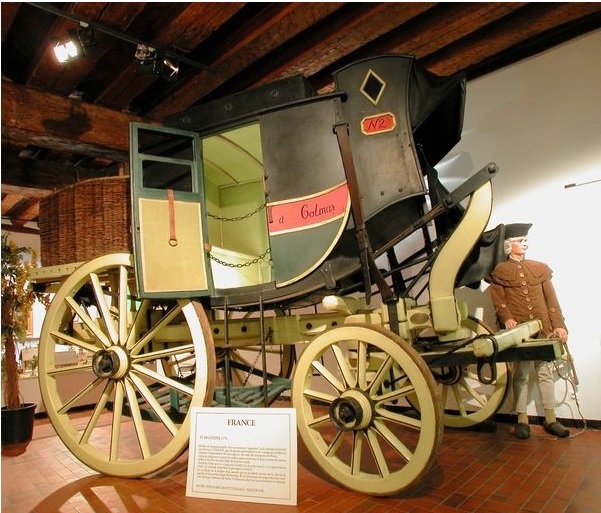 According to Turgot's requirements, existing vehicles were to be replaced on major routes by stagecoaches ("diligences") which were "commodes, légère, bien suspendues". They were to have either eight places and be drawn, depending on weight, by six, seven or eight horses, or four places and be drawn by five or six horses. Horses were to be supplied by the post masters at 20 sous each, with a whole machinery of inspection and fines in place to guarantee that suitable horses were made available. Coaches were to achieve a minimum speed of two leagues (six miles) per hour. Paperwork carried by the conductor was to be completed at each post to record times of arrival and departure. The first coach of the new service finally left Paris in April 1776 but only a few routes (Paris to Nancy, Châlons-sur-Marne, Sedan, Soissons, Saint-Quentin, Noyou) became immediately operational. At the time of Turgot's fall in May the farm was almost immediately reinstated, to remain in place, apart from a brief interlude under Necker, until the Revolution. 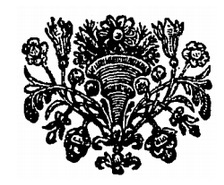 The final tally of the whole ruinous exercise was given by Calonne in 1786 as over five millions livres, the only lasting legacy being the "Turgotines" themselves. The Turgotines represented the first attempt at improved design and speed since the introduction of carriages with suspension in 1739 and they were undoubtedly able to benefit from the expansion which had taken place over the century both in the road network and the provision of relais de poste (from 800 at the turn of the century to almost 1,500 by the 1780s). Their real impact of is difficult to assess without comprehensive details of routes, numbers and travel times. They were certainly FASTER - timetables reveal appreciable improvements in travel time: by 1778 it was possible to cover Paris to Bordeaux in five and a half days; Rouen was now a mere day's distance as opposed to two. Public carriages, so called at the time of the changes which M. Turgot made in all the mail-coach services of the kingdom, with the aid of an exclusive government privilege. The journey in these vehicles is so miserable that it could give rise to the erroneous idea that the minister deliberately set out to torture people. The body of the carriage is so narrow, and the seats so crowded, that, when it comes to getting out, travellers have to ask their neighbours for the return of their arms and legs. The step up is inconveniently high and impractical for women. If there happens to be a passenger with a big belly or large shoulders, everyone must suffer; you groan and put up with it or you abandon your journey. The regulations governing these privileged stagecoaches always put the interests of the freight before those of the traveller. Pregnant women, convalescents and those of a delicate constitution find the suspension so basic, the seats so narrow, the step down so dangerous, that they consider it a torment to enter the coach and a joy to finally escape. 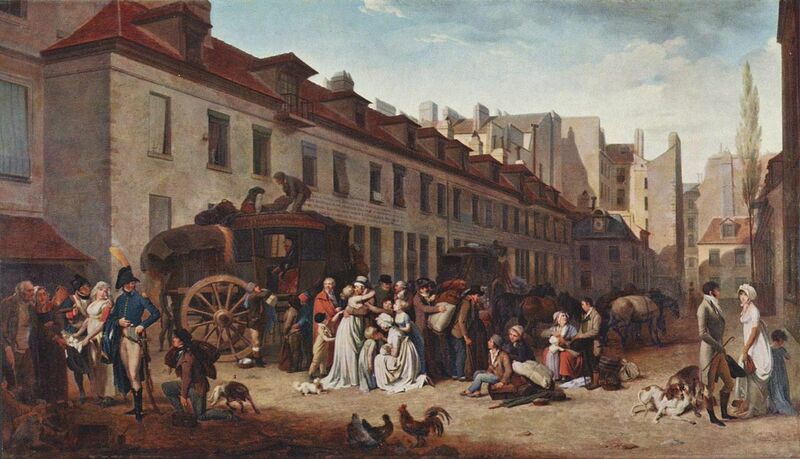 Louis-Sébastien Mercier Tableau de Paris, New ed. Amsterdam 1783. Vol. 5 p. 331-4. L'histoire des postes et des télécommunications en Alsace, website.